Hello Everyone, hope your day is great!! 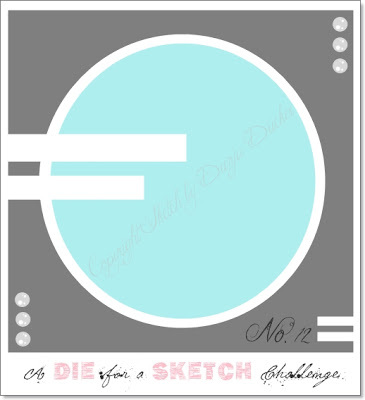 A Die For A Sketch is having a DT call also!! Please leave your entry and DT by your name if you would like to be considered as a DT on our Challenge Blog, I would love to have my friends part of a team that I am on! Congratulations May Please email me with your address so I can send your prize right out!! Today I am showcasing a Magnolia stamp called Goosebump Tilda with Magnolia papers. On the inside of the card I layered the Magnolia Doohickey Lace die, dragonfly and mini tag. Here is the closeup of the tag that I colored in Copics and used a word sticker on it. I wanted to try out vellum on my card after seeing the gorgeous DT creations over at Magnolia-licious Challenge Blog So I used a Papertrey Ink doily die and a Magnolia Doohickey dragonfly to cut my vellum and then stickled the edges. You can see it here. Here is more vellum I cut from a Marianne leaf die to enhance my flower. The sentiment is a Spellbinders mini ticket die. More vellum leaves with my Wild Orchid Flowers and some pearls. Good Luck to you in winning one of those awesome prizes from our sponsors. Gorgeous card Kelly! Cute image and I love all the detail you add and the time and care which goes into each creation. Beautiful card Kelly. And the flowers are so gorgeous. Lovely card. The butterfly is beautiful. Gorgeous card, Kelly. Love the light blue colors, makes Tilda looks so soft. Fab coloring as always and lovely on the inside as well. Oooh I love love love it! Who knew a goose could look so romantic?!? Your colors are perfect together...love it! P.S. Did I mention I love it?!? Lol! Another beautiful card Kelly, fabulous colouring and once again your attention to detail really comes across. Stunning work hon. Pretty card and beautiful Tilda coloring Kelly! WOW oh so pretty and love your colors. OMGgggg...this is so incredibly precious! Adore this sweet image...one of my favorites! Love her black hair and all the luscious details surrounding her! An extraordinary creation, Kelly! So adorable... sorry I've got behind on visiting - it's been one of those times!! Love all of your embellishments. Your use of vellum is wonderful. Hello Kelly, this is sooooo cute! love the pretty shades of blue, the delicate lace, and die cuts, and the inside is sooooo lovely! Hugs. Gorgeous card! I love all your embellishments. Your color palette is beautiful. adorable crd Kelly and as always very well done!!! Oh gorgeous card, Kelly. Adorable Tilda and beautifully coloured. I bought this stamp late and never got around to colouring it 'cause stamps from the new collection arrived..LOL. Wonderful colour combo--I love anything with blue. 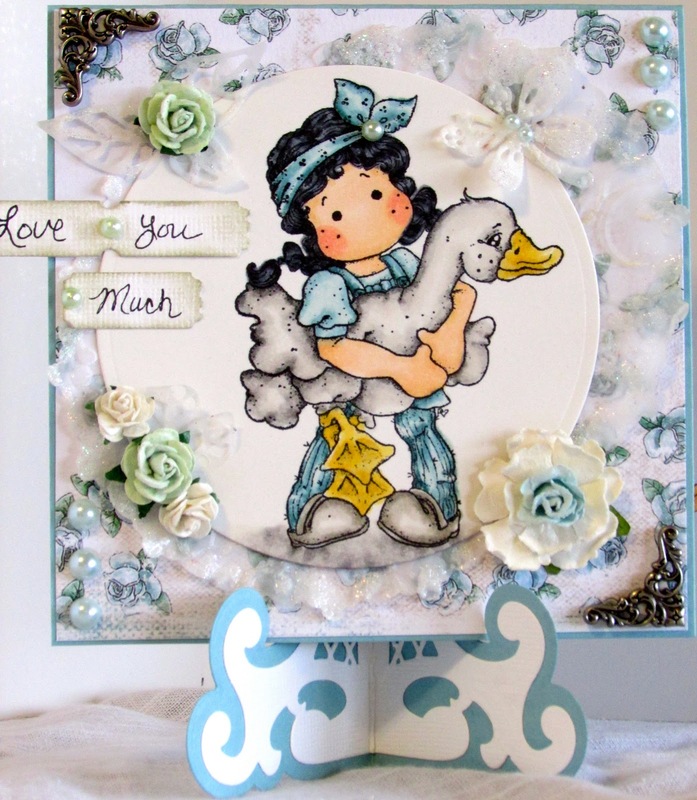 Lovely DP's embellishments and diecuts. This is totally stunning! Love your colors and all of the luscious details. Gorgeous inside and out. Another great job! Stuning card rich in lovely details. Great colouration of the stamp. Oh so nice card, a beauty ! Superb details ! Wow oh wow, this is gorgeous! !